WASHINGTON – During his final press briefing from behind the White House podium Wednesday, departing White House Press Secretary Jay Carney acknowledged that President Obama occasionally listens in on the phone calls of American citizens being monitored by the NSA. Carney said the president’s participation is sporadic and is strictly for amusement and educational purposes. After a book signing in Gary, Indiana this afternoon, former Secretary of State Hillary Clinton confessed to reporters that it wasn’t uncommon to see the president listening to NSA tapped phone conversations during meetings in the Oval Office. After a high spirited game of Jarts this afternoon with Barbra Streisand and Rev. Al Sharpton, President Obama spoke with reporters in the Rose Garden. Fox News reporter Ed Henry questioned the president about the validity of eavesdropping on American citizens’ phone calls. ED HENRY: Mr. President, do you feel the need to apologize for listening in on private telephone conversations of the American people? 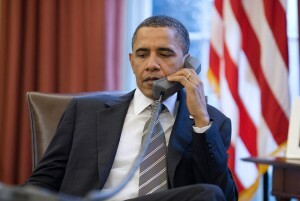 OBAMA: First, let me explain that I am not aware of the identity of the people on the other end of the phone line. ED HENRY: So you believe it’s OK to listen if you don’t know who you’re listening to? OBAMA: I’m not necessarily saying it’s OK. I mean, the American people have a right to privacy and I for one have fought for that since my administration began. ED HENRY: With all due respect, Mr. President, how can you say you’ve fought for something that you personally disregard? 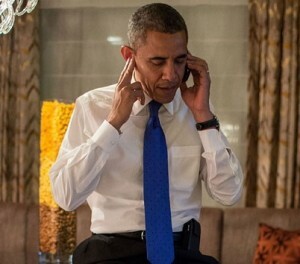 OBAMA: I have no idea who I’m listening to, Ed. Do you understand my point? If I don’t know who the people are, what kind of damage is actually being done? OBAMA: Look, Ed, it’s the age old question, if a tree falls in the forest and there’s nobody there to hear it, does it make a sound?